If you live in an area that is high risk for flooding, like Bay County here in Florida, it’s a good idea to be personally prepared for a flood. If you don’t want to be responsible for helping everyone in your neighborhood because you are the only one who was prepared, then it may be a good idea to help your neighbors be prepared for flooding as well. 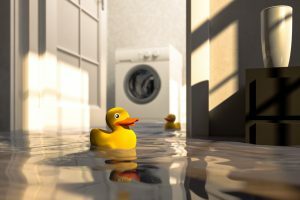 Here are some tips from for Daystar Cleaning on how you can get your neighborhood prepped for water damage. Especially if there are elderly people on your street, it would be very useful and safe to have proper emergency procedures in place when there is a storm or heavy rainfall. If you do not have neighborhood meetings, take it upon yourself to schedule them. This can be daunting at first, especially if you don’t know your neighbors very well, but it could mean the difference between life or death for some people in rough situations. At your neighborhood meetings assign a phone tree list. Make responsible people, who you can trust, be at the top of the phone tree, so you know that everyone gets reached. If there is an emergency and flooding is occurring on your street, then have everyone check on each other. If there is a problem, the phone tree should start again so neighbors who are able can help those fighting potential water damage and mud coming into their home, etc. If there is a flood that is so large that it requires you and your neighbors to evacuate, there should be an emergency route in place. Some neighborhoods, especially older ones may not have the best roads might not be paved, or could just be confusing. It would be easier to navigate the streets if there were signs clearly marking an evacuation route. You could have temporary signs put out by someone who was assigned to your neighborhood meeting, or you could collect money from your neighbors to have permanent ones put up. Whatever the case, it is a good idea to have traffic flowing in one direction. Driving in even one or two inches of standing water can be very dangerous, and it would be helpful to not have vehicles colliding because they are going in opposite directions. It may sound a little crazy and dystopian to prepare food storage for emergencies, but it can be really helpful, not only for flooding or natural disasters but also for a financial crisis too. Having a supply of up to a few months worth of food stored in a safe, dry place can help you when you might be financially struggling after trying to repair the water damage from a flood. There are many websites that can help you find good ways to store food long term or how to make food storage part of your normal diet. If you live in an area where floods are prominent, you may want to at least have a three day supply for every member of your household including items that are easy to prepare without a microwave or an oven in case you are without power for a while. When a water disaster does happen to you, it is important to immediately call a professional team that is certified in water damage cleanup and restoration. Daystar Cleaning in Bay County Florida is a qualified professional company that has the experience and skills to clean up all sizes of water disasters.